After a long-delayed schedule, and having been announced years ago, Interstellar Operations released January 28, 2016. 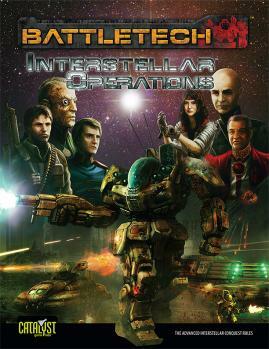 The book contains almost 400 pages of rules from various angles, from generating a star system and planets to detailed information on playing in different eras of the BattleTech universe. Many of the rules systems were released some time ago for playtesting and feedback from the community while the book itself was in Beta for around 6 months. That’s given us a long time to get a chance to try out various rules systems and to give them a go in our campaigns. Now the finished product is here. I’ll be most looking forward to giving the Abstract Combat System (ACS) a serious run now that it’s been released. This is a system designed to make playing very large scale multi-unit and multi-regiment battles feasible and to quickly resolve them. I never really got a chance to try them out too much in Beta, so I want to see how the rules might have changed and then give them a full shakedown this weekend to see how they play out. We now have a lot of alternative ways to play, from Alpha Strike and BattleForce to ACS and Inner Sphere at War. We always had some systems before in these alternate books, but I don’t recall them seeing a lot of play anywhere that I was playing BattleTech, so I’ll b interested in seeing if they get a lot of play, or if they are just too many systems to understand. I want to try out ACS, so we’ll see how that works out. What are you most interested in trying out? Is there anything you really liked from the Beta? What’s your playgroup excited about? This entry was posted in News and tagged BattleTech, news on 2016/01/29 by Abe Sargent.